The AMC Matador is a mid-size car built and marketed by American Motors Corporation (AMC) from 1971 to 1978. The Matador came in two generations: 1971 to 1973, and a major redesign from 1974 to 1978. The second-generation four-door and station wagon models were classified as full-size cars and did not share the distinctive styling featured by the Matador coupe that was introduced in 1974. 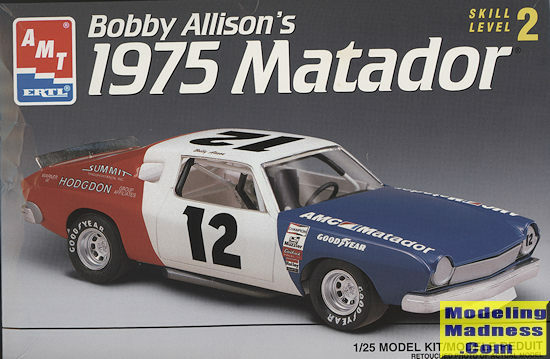 Factory-backed AMC Matador hardtops and coupes competed in NASCAR stock car racing with drivers that included Mark Donohue and Bobby Allison winning several races. The new Matador coupe was featured in The Man with the Golden Gun, a James Bond film released in 1974. Matadors were a popular vehicle for police, as it outperformed most other police cars. It was also featured in many television shows and movies during the 1970s. Interestingly, the Matador couple was a completely different body style from the sedan. It was felt that the styling would be its major draw and the type was built from 1974 until 1978. However, during that time, America's taste in cars turned towards smaller, more fuel efficient vehicles, spelling an end to the Matador line. This is the NASCAR version of this kit and as such has quite a few different parts to the standard coupe (assuming AMT even did this one stock). For instance, there is a different grille insert, covers for the rear side windows, a roll cage, gutted interior with a single driver's seat, racing dash and other interior bits. For the chassis there is a dual shock front suspension, a large rear traction bar and the front pan has axle blocks to raise or lower the front end. The body has a separate hood and front grille assembly with separate bumpers. A spoiler is provided to sit atop the trunk. Racing wheels and properly wide tires are also supplied. The bumpers have small fairings as was used to help smooth out airflow around them. The engine has straight pipe exhaust and a single four barrel carburetor as is required by rules. Interestingly, the air cleaner cover attaches to the firewall. The kit does not provide the window net used on these cars and one is directed to make one from balsa wood and thread. Instructions are typical of the time with all construction color information provided in generic terms during the building. The overall car is in the red, white, and blue scheme adopted for all AMC racing cars. This not a Round 2 kit so the decal sheet is probably the worst part of this one as it has not aged well. All the glue has turned a yellowish tint and while the thick, glossy decals will probably still work, they will be within what will be a bit of a sludge when the decal is dampened. I would hope that there are aftermarket replacements. 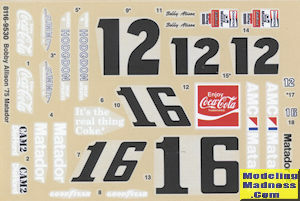 There are markings for two cars, both driven by Bobby Allison that differ only in some of the sponsor decals. To be honest with you, I've always considered AMT kits to be second string when compared to Monogram or even Revell kits. Monogram did the best, Revell tended to be fiddly (though when Revell and Monogram joined up, all Revell kits since have been Monogram quality), and AMT kit were often plagued with soft detail and generally poor fit. I do not expect this one to be any different, however, it is an interesting subject and worth picking up as I doubt if Revell will ever do it.